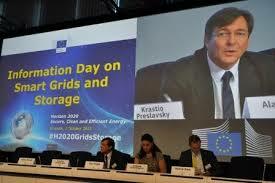 Info Day on Smart Grids & Storage – Bruxelles – Ser | Società energie rinnovabili s.p.a.
SER participated at the LCE 2016 – 2017 information day forthe integration of smart grid and storage solutions in European electricity networks. The event was held in Brussels and was attended by 300 pleople, including research bodies, private companies and institutions. Project proposals submitted by SER in the networking sessions were complimented by various partners at the event. This was an opportunity to hold meaningful conversations about crucial issues with potential collaboration partners.